Hello and Happy Tuesday! It's been a beautiful couple of days here and we're hoping for many more like this. I'm soooo glad it finally dried out and the sun has been shining! It is actually beginning to feel like Spring and to start it off in normal fashion, Jeff and I went to my granddaughter's first softball tournament on Saturday. I expect there will be many more ballpark visits in the next few months. This was a tournament for my 9 year old granddaughter, Taylor. Next weekend there will be one for Taylor again as well as her 7 year old sister, Laken. 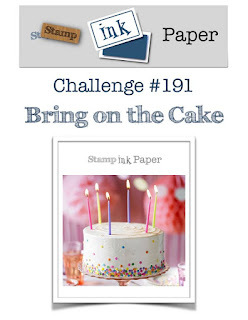 As usual on Tuesdays, it's time for another Stamp, Ink, Paper Challenge. This week is all about birthdays. This is a good challenge for me since I always need a good supply of those! I used a combination of the Concord & 9th Laurel Frame Bundle and Shiplap Sentiments for this one. I love the Shiplap so much that I didn't want to cover it up so I positioned the Laurel frame to the far right side. 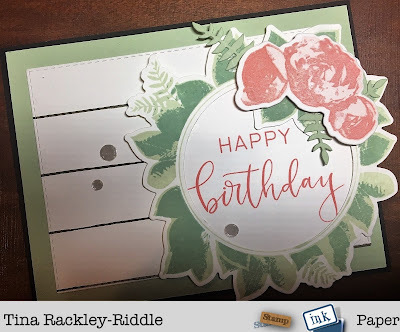 I finished it off after mounting it on Pistachio Pudding Cardstock and then Basic Black Cardstock and adding three Sparkling Clear Confetti Sequins by Pretty Pink Posh.